Finished marigold and cockscomb flowers shown with a miniature sugar skull for the Day of the Dead. Photo copyright 2009 Lesley Shepherd, Licensed to About.com Inc.
Dead of the Dead Shrines are traditionally decorated with the bright yellow flowers and petals of marigolds (cempazuchitl) and brilliant red cockscombs. They symbolize man's brief period on earth, and the strong scent of marigolds is believed to help souls find their way home. These miniature flowers in dolls house scale are fairly simple to make. The marigold uses strips of fine tissue paper, and the cockscombs are made from thread. 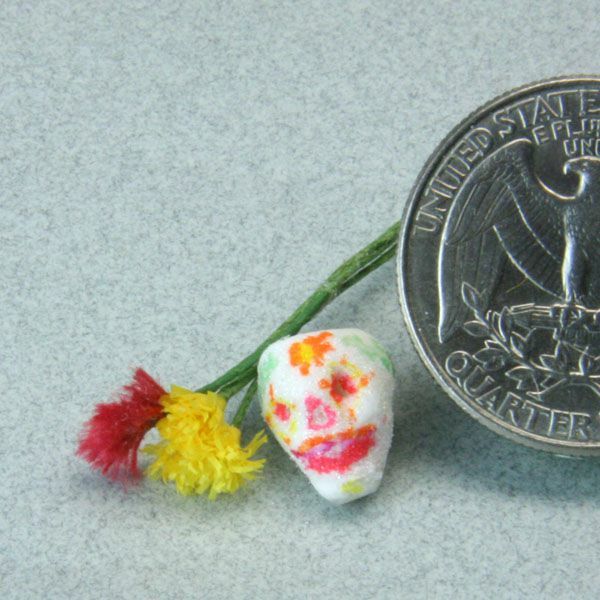 They can be used for many miniature arrangements, as well as used to decorate miniature ofrendas for Los Dios de los Muertos. Glue, tissue paper, scissors, wire, thread and paint, used to make miniature marigolds or cempazuchitl and cockscombs for Day of the Dead shrines in dolls house scale. Photo copyright 2009 Lesley Shepherd, Licensed to About.com Inc. Bright Cerise or Dark Pink Thread for the cockscomb flowers. If possible also a small amount of similarly colored bunka embroidery thread. Fine Paper Wrapped Wire I use 26 or 28 gauge wire. Green Acrylic Paint to paint stems and calyxes for the flowers. Fine Paintbrush to paint the base (calyx) of the flower. Strips of paper 1 1/2 inches by 1/16 inch, 1/8 inch, and 3/16 inches, used to make dolls house scale miniature paper marigolds. Photo copyright 2009 Lesley Shepherd, Licensed to About.com Inc. The miniature marigolds are made from finely fringed paper strips. To make each marigold you will need to cut three strips of colored tissue paper, each roughly 1 1/2 inches long. One strip should be 1/16 inch wide, one strip should be 1/8 inch wide, and one strip should be 3/16 inch wide. The widths are approximate, and don't need to be cut exactly. If you want to make bunches of marigolds, cut long thin strips and fringe them (see the next step) then cut them to the correct length for the flowers. Try to cut the edges of each strip as straight as possible. Use a paper cutter if you have access to one. Very fine fringe cut into strips of paper 1/8 inch wide to make a miniature marigold or cempazuchitl for Dia de los Muertos. Photo copyright 2009 Lesley Shepherd, Licensed to About.com Inc.
Marigolds have gently rounded petals. To get as close to this as possible in miniature you will need to cut each strip of tissue paper into as fine a fringe as you can manage. To get the best control over fine cuts, use sharp, straight bladed scissors and keep your scissors still. Move the paper and not the scissors for better control. Cut the fringe down close to the base of the strip, leaving 1/32 of an inch uncut. Try to cut each piece of fringe the same width if you can. To make the miniature marigolds or Cempazuchitl more realistic, use rounded scissors to trim the tip of each section of fringe to a rounded shape. The easiest way to do this is to cut all the tips of the fringe strip going one way, then reverse the paper and cut the second half of the tip of each piece of fringe going in the other direction. You can skip this step if it is too frustrating! When you have cut your paper strips into fringe, cut the fringe into 1 1/2 inch lengths. You will need three different widths of fringe (made by fringing three different widths of paper cut in the previous step) for each flower. If your fringe breaks as you cut it don't worry, the smaller sections can be used, you will just need to watch how you glue them to the flower. If you have trouble cutting the fringe close to the bottom edge of your strip, cut it as evenly as possible and trim the strip close to the base of your cuts after you have cut the fringe. A layer of fine fringed paper is wrapped around a piece of wire to start making a miniature marigold or cempazuchitl, for a dolls house scale ofrenda. Photo copyright 2009 Lesley Shepherd, Licensed to About.com Inc.
Take a 1 or 1 1/2 inch section of wire, and carefully wrap the glued edge of your fringe around the top end of the wire, keeping the paper layer straight on top of itself as you turn the wire into the glued edge. When you have tightly wrapped your strip of paper fringe around the top of the wire (keeping the fringed edges free) set the marigold aside to dry and work on another piece of wire. Finish all the center sections of your marigolds before you proceed to the next step. Beginning with the shortest layer, longer layers of fringe are wrapped around the base to form a miniature marigold or cempazuchitl in Dolls House Scale for Day of the Dead Shrines. Photo copyright 2009 Lesley Shepherd, Licensed to About.com Inc. Using the same technique as in the previous step, add the medium width fringe strips on top of the previous layer of fringe you placed on your wire stems. Try to keep the base of the fringe strips even as you glue them to the marigold stem, and keep the paper fringe tightly wrapped to the layers underneath it. When your medium layer of fringe is dry, add your longest layer of fringe in the same fashion. Set the marigold flowers aside to dry. If you wish, you can paint a green calyx or tiny leaves over the base of the fringe where it is attached to the wire, to blend the tissue paper more naturally into the wire. Make sure all the paint and glue is thoroughly dry before you proceed to the next step. A miniature marigold flower in 1:12 dolls house scale ready to be fluffed out for a bouquet. Photo copyright 2009 Lesley Shepherd, Licensed to About.com Inc. When all the layers of paint and glue are thoroughly dry, use your fine pointed tweezers to gently pull down the fringed layers of the petals to shape the flower into a rough dome. The easiest way to do this is to take the outer layer in your tweezer blades, and gently roll it until it is at a right angle to the wire center. Continue working around the flower, teasing out the various layers as you go. If your flower looks unruly (usually because the layers weren't glued on top of each other as you formed the flower) use your scissors to trim out of scale petals to shape. If you have trouble teasing your flower apart because it is very tight. You may need to tease the flowers before you glue down the next layer. This will depend on how tightly you can roll the tissue paper around the wire, and how large you have cut your fringe of petals. Experiment and find the method that works best for you. If you need marigold leaves the easiest way to make fine leaves that look like they are from marigolds, is to use green dyed reindeer moss in small sections. If you have very finely cut leaves from paper punches, you can attach them to the stems of reindeer moss to create marigold leaves. Lengths of thread are glued to wire in a fan shape to form the start of a dolls house scale cockscomb flower. Photo copyright 2009 Lesley Shepherd, Licensed to About.com Inc.
To make miniature cockscomb flowers, cut twenty or so 1/2 inch lengths of thread in the color you wish your flower to be. You may find it easier to use longer lengths of thread so experiment with a few flowers to find the method that works for you. Glue the thread in a careful fan across the top of a 1 to 1 1/2 inch length of paper covered wire (see photo). Don't worry about the top ends of of the thread, but try to get the base ends of the thread to line up in a neat side by side fan of thread, laid on either side of the piece of wire as shown. Thread is trimmed to an undulating fan shape and the base of the threads is painted. Photo copyright 2009 Lesley Shepherd, Licensed to About.com Inc. When the threads are firmly secured with glue to the top of the wire, trim the excess thread length away and shape the threads into a fan, a little more than 1/4 inch long as shown in the photo. Cover the base of the threads where they touch the wire with a bit of acrylic paint, the same colors as your wire. The acrylic paint over the threads will make the base of the flower. Set the flower aside to dry. Miniature cockscomb flower in dolls house scale. Photo copyright 2009 Lesley Shepherd, Licensed to About.com Inc.
To finish the miniature cockscomb flower use a sharp pin to tease apart each one of the threads in your fan. When you have separated the fibres so the flower is a neat fan, use sharp scissors to cut notches into the fan approximately 1/3 of the way across the fan from either end. Use the scissors to trim the fibers back to the same height in the fan. If you wish you can give the cockscomb flower the corkscrew style top, by gluing a bit of bunka thread across the top of your modified fan.